The Jaguar, born during the ‘60s thanks to a development partnership program between French and British aviation companies, is one of the most famous and “long lasting” ground attack and close air support aircraft used by British Royal Air Force and French Armée de l’Air. After the Iraqui invasion of Kuwait, the French Government joined to the International Coalition and launched the operation “Daguet” by participating in the first Gulf War. 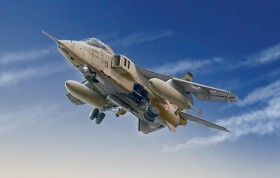 The Armée de l’Air Jaguars, deployed in the Saudi Arabian airbases, provided a significant contribution and successfully performed, thanks to the improved capability to use laser-guided weapons, close support and strike missions against ground targets, command centres and communication lines.